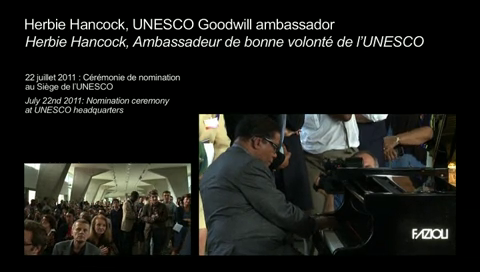 Jazz icon Herbie Hancock was inducted as a UNESCO Goodwill Ambassador for Intercultural Dialogue, in a ceremony at UNESCO headquarters on July 22, 2011. Hancock is a music legend, with a career that spans over five decades and has won him a slew of pretigious awards, including fourteen Grammy Awards and an Oscar. Authors and personalities: Irina Bokova, presenter. Herbie Hancock, participant.